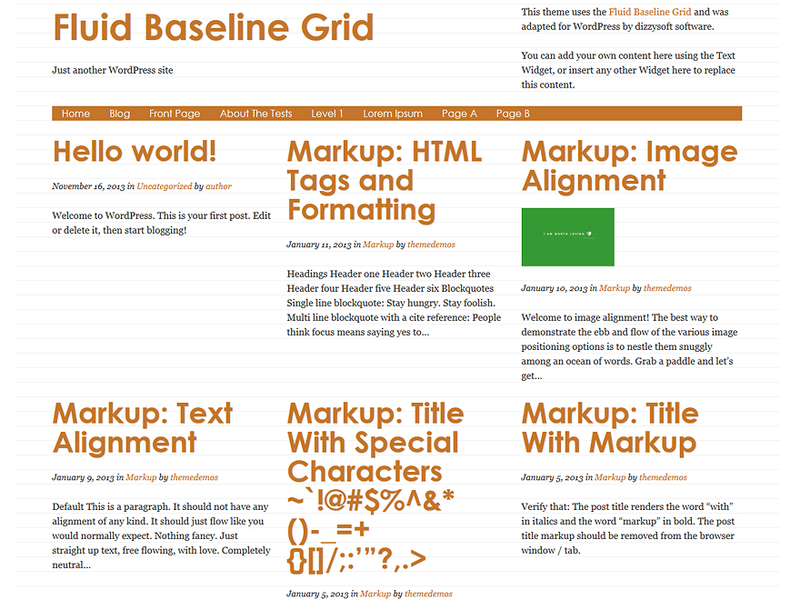 I’ve taken the Fluid Baseline Grid (originally created by Josh Hopkins) and converted it into a mobile-first, typographically clear WordPress theme. Responsive and designed from a “mobile first” perspective. Even images are scaled responsively. featured images per post displayed both in page archives and prominently at the top of each post. Please feel free to change the fonts and colors of different elements in the style.css file but if you want to keep the typographic benefits of this theme, do not change font sizes, margins or any sort of spacing. In fact, this is what I’ve done on this website. Recommend setting Settings > Reading > Blog Pages Show at Most to a multiple of 3, since this is based-upon a three-column grid for all pages that display more than one post. If you’d like to see a live-version of this theme, please visit my personal site: http://zimorama.com/ (and this site is running a child-variant of the theme as well).